Home > We Win Fab NHS Award! This week Community Integrated Care were recognised at the FAB Awards 2018 for their collaborative Activity Academy event. We were exceptionally proud to win the “Penguin Award” celebrating collaboration between teams or organisations, who come together to overcome a challenge for our innovative Activity Academy event. 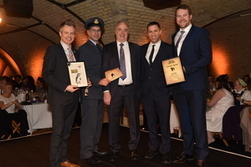 The annual FAB Awards, held in Old Billingsgate Vaults, recognises “fab” people and teams bringing great innovation and best practice to the sector. The Activity Academy was an innovative training event, aimed to develop a new model for training frontline carers in how to utilise creativity and person-centred approaches to improve the lives of people living with dementia. Held in collaboration with NHS Halton CCG, Halton Borough Council, The University of the West of England and rugby league team, Widnes Vikings, the event showcased how multiple organisations can come together to achieve exceptional outcomes - with feedback indicating that 100% of attendees were inspired to deliver new approaches to promoting activity, and a post-event analysis demonstrating that all surveyed participating services went on to enhance the support that they deliver, the Activity Academy achieved impressive results.